Best Marking Effect: The laser beam of a fiber laser is fine and thin. It can provide the best marking effect among all the laser machine machines. Especially good in smallest character marking, such as the mark on IC chip. Deep Marking: Fiber laser can make deep marking up to 0.5mm on stainless steel and aluminum. While YAG and Diode marking only could mark 0.2mm-0.3mm. So it’s suitable for the industries which have high requirement for the depth and accuracy. Higher Accuracy: Fiber laser can reach up to 0.001mm precision, while diode only 0.01mm. 10 Years Long lifetime: We used the fiber laser module made by Germany IPG technology, the lifetime of the fiber laser device is 100 thousand hours, so the machine can be used for 8-10 years. As for diode laser module is 20 thousand to 30 thousand hours and only can be used for 1-3 years. No consumables: Fiber laser machine can be used for 8-10 years with any consumables. No need to adjust the laser path: Fiber laser beam comes out from the fiber device directly, so no need to adjust the laser optical path. While Diode laser needs to adjust the laser optical path regularly. 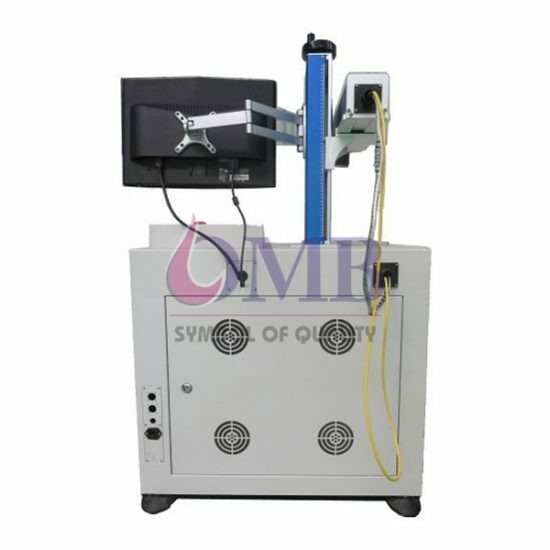 Free of Maintenance: Fiber laser machine can be used free of maintenance. Diode laser needs to change the diode module and recycle water regularly. Use Integrated Air Cooling: Fiber laser uses integrated air cooling, and the cooling effect is excellent than the water cooling used in Diode and YAG laser. Also, air cooling no need to maintain, save many cost and energy. Low Power Consumption: Low cost, only 0.5kw/hour. While Diode is 3kw/hour, and YAG is 5 kw/hour. The fiber laser is more economized and environmental. Small and compact: The volume of fiber laser marking machine is small, only 0.12 M2. It can be put on the desk and easy to install.